The following is a testimony of God's abundant grace and love toward us written by Pastor Thomas Rai. My name is Thomas Rai. I am from a Hindu background, one of the Rai tribe in Nepal. This is middle class castes, who worship different ancient cultural gods and goddesses, as well as idols of our own ancestors, lands, stones, rivers, big trees, and mountains. In 1972, a German Christian Brother, K.P Kugler, came to live in our village for 4 Years to teach the Gospel of God, and to learn our language. I came to know the Lord as my Saviour 30 years ago. Before I come to know the Lord, my mother was very sick. My father allowed the practice of the traditional healers for a long time, but she was not recovered. I was so sad at that time because I used to think that I would become an orphan if she died. It was then that I heard the Gospel from this German brother. I accepted the Lord as my Saviour. I prayed for my mother and she was healed. After this, I really experienced Him in my daily life. At the beginning, there were six of us who believed. We started to gather every evening to worship the Lord under the tree outside the village. We were very active in the village. Many villagers believed in Jesus Christ and joined with us to pray. We preached the gospel from village to village. The number of Christians increased daily. We were terribly persecuted for living a true Christian life and preaching the gospel. The first time I was arrested, they found me in my house. They bound me cruelly with ropes and began to beat me badly in front of my crying parents and wife. I was then taken to the police station. That night a drunkard police officer came and called me to another room. There he began to swear at me and beat me up every badly. I was afraid when he said that he would beat me to death with stick. As he was beating me, I suddenly became very thirsty and I cried loudly for water. Then a 13 years old believer, Simon Rai came in with a glass of water. He had followed to help me as far as police station. The officer did not allow me to drink. As he continued to beat me, my scream alerted another neighbor, a non-Christian boy whom I did not know. He came into the police station and tried to take away the stick. In the struggle, the officer broke that stick and he had to go out to get another one. The boy took my hand and dragged me outside and pushed me out to escape. The officer returned with another stick and began to beat me again. That boy again struggle with the officer. The beating boy was so sever that I almost fainted. When the officer left because the second was again broken, the boy took my hand, dragged me outside and pushed me out again. Then I escaped into the dark night barefooted. When I was very far from the police station, I stopped to consider what I was to do where to go. I prayed to God in my heart, and I felt that God said, "Don't go back to your village. Go to Duncan Hospital to meet the Christians." Since that hospital was in Raxaul, India, I decided to walk. The route was very narrow, hilly, forested and inhabited by many wild animals. It was very dangerous in the night and I fell down many times. That night I crossed many villages and hills. Next morning I was very hungry. As I was wondering where to get food, since I had no money, I recognized an edible plant in the ground to see it was very large. It came out easily. As I was walking and eating the root, I met two people on my way. They were surprised to see me eating such a big root. When I told them my story, they were very kind to me and wanted to help me. They asked me to carry their small rice bag for them. When we reached Hetauda City, they fed me a plate of rice with meet at a small restaurant and thanked me. But since I needed money to go on to the hospital in India, I asked them if they would buy the new shirt I was wearing. I had another older shirt on as well. With the money, I was able to cross the border by bus, and walk the rest of the way. With much difficulty, finally reached Duncan Hospital, there I found Mr. Rishi Raj Acharya, who I had met before at Bible Training. He was very kind to me and arranged a job for me as bookseller in Hospital's Christian Bookshop. He also encouraged me to preach the gospel to Nepalese patients staying in the hospital, and he also provided place for me to stay there. Through his help, I was able to inform my grieving family of my whereabouts. 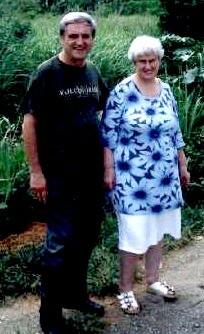 I was also able to visit my grandparents who were living in the neighboring district. They were happy to see me, because they had already heard that I was killed by the police and my body was hidden somewhere. After some days my elder brother visited me at the hospital bookshop. He told that everything was fine now and that I could return home. But now that I had a job, I didn't want to go back. My brother prevailed on me, that as the first Christian being persecuted, I had to be an example to other Christian and the Hindu villagers. So, I decided to return with my brother. For the following two years, I was able to preach the gospel and lead the village church. As more and more villagers believed, the Hindus became angry with us, their Hindu practices. Again they reported to the police, political leaders and District Officers. Many times the police came to arrest other Christians and me. But, they did find me. One day, the military came and arrested my elder brother. In the army camp, he was put into the well for two hours. The next day they handed him over to the Pradhan Pancha (an Elected Political Leader) who drove all the Christians of the Rai caste to lower caste. They ordered all Hindus not to eat, drink, talk or live together in the village with us and not to marry us. As a result, even our relatives did not dare to talk us or help us. In all these difficult times, God was with us. Even though, we were not allowed to fish with the villagers. One day I saw in a small river many fish swimming. So, I decided to make a bamboo trap and cover it with branches. The following morning, I was surprised that the trap was full of these large fish. I had never caught so many large fish before. As we dried these fish on fire, the news spread to the villagers. The following night, some of our Hindu relatives' came secretly to ask for some of the fish. Slowly, more and more villagers started to visit us, and later even helped us to built house and ate openly with us. Some even believed in Jesus and moved in with us. There was calm for about a year, and then the persecution once again came upon us. Many Christians (including my family) were imprisoned and severely beaten. Some were forced back into Hinduism. 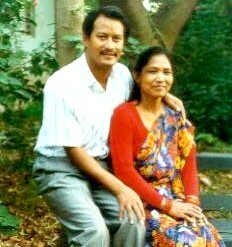 After enduring much suffering and difficulties, my parents asked to leave for Kathmandu in 1976 either to study or work. I was there for three years. I finished high school at night while working in a mission office. Then I left for Terai to work as a school teacher. Every weekend, I would go back to my village, where my Pastor uncle would ask me to preach the word of God (because he said I was more educated than he was ). He encouraged me to consider getting training to serve the Lord in Bible Collage, since there is such a great need for trained leaders in Nepal. In order to prepare myself for Bible Collage, I left teaching and completed my studies for 4 years of IA and BA degree at night while working for the Mission during the day. Someone suggested that I should attend a short-term Advanced Leadership Training (Haggai Institute) for one month in Singapore. After this I got an opportunity for two years of Bible Training in Hong Kong, where I learned a lot of spiritual teachings from the word of God, which changed my life more and gave me right directions to serve the Lord. After I came to Nepal, my Lord led me to start "His Church" in Nepal. So now I am serving Him as a pastor in the Church. In this way, "Grace Church" came to exist. Praise the Lord. Now, I want to lead my church wisely according to Lord's will and leading by being Holy Spirit in order to shine into the darkness in this world and into the dark society. This is my goal in my life, burden and my vision in the Lord. I am not perfect yet but I am in a learning process. I try my best to fulfill HIS will and to make God the center of my life. I'm serving God from my heart. Please remember us in your prayer.